A WIDOW'S four-year fight for the truth after her soldier husband was killed in Iraq ended yesterday with the Ministry of Defence being criticised by a coroner. Tank commander Steve Roberts was shot and killed by his own side as he struggled with an attacking Iraqi. He died because of an "unforgivable and inexcusable" delay in providing body armour to troops, a coroner ruled. His widow, Samantha, said the mistakes must not be repeated with other equipment. Sgt Roberts, 33, of the Royal Tank Regiment, was attacked by the stone-wielding Iraqi while manning a checkpoint outside the southern city of Az Zubayr early on 24 March, 2003. An Army Board of Inquiry found the Browning pistol with which he tried to shoot the Iraqi failed and he was then shot by a comrade in a Challenger tank who was trying to protect him but did not know the high-powered tank machinegun was inaccurate at short range. The inquest into Sgt Roberts' death heard he was left exposed by "serious failings" in the army's supply and training methods which meant he had to give up his personal body armour just three days before. Had he been wearing the 167 enhanced combat body armour (ECBA) he would have survived. Recording a narrative verdict, which simply records the circumstances, deputy coroner Andrew Walker said: "To send soldiers into a combat zone without the appropriate basic equipment is, in my view, unforgivable and inexcusable and represents a breach of trust that the soldiers have in those who govern. Enhanced combat body armour was a basic piece of protective equipment. Sgt Roberts lost his life because he did not have that basic piece of equipment." Mr Walker said Sgt Roberts' death was as a result of delay "and serious failures in the acquisition and support chain that resulted in a significant shortage within his fighting unit of enhanced combat body armour". The week-long inquest in Oxford tried to determine why more than 2,200 troops were sent into combat without ECBA. Sgt Roberts' fears were recorded in messages to his wife. Geoff Hoon, the defence secretary at the time, was told six months before the conflict began that 37,000 extra sets body armour were needed. But the hearing was informed by the MoD's director of capability that tendering for contracts would have revealed preparations for an invasion. SERGEANT Steve Roberts' widow, Samantha, said she hoped the inquest verdict and changes in military procedures would be her husband's "legacy". She said: "We have been waiting for four years to find out what happened and why. "The loss of Steve to us cannot be measured. This has been the driving force behind our quest for answers, some of which we feel could have been provided earlier. "The policy on enhanced combat body armour has changed - this is Steve's legacy - but we must ensure that these failures are not repeated with other basic kit. "We have heard from Steve himself, who said it is disheartening to go to war without the correct equipment. 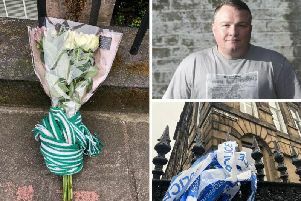 "The coroner found failing in training and command in the run-up to and after the shooting, but the single most important factor was the lack of enhanced combat body armour. If Steve had had that, he would be with us today." Meanwhile, Liam Fox, the shadow defence secretary, said: "To send soldiers into combat without the appropriate equipment is utterly inexcusable and in a more honourable government it would have resulted in resignations."